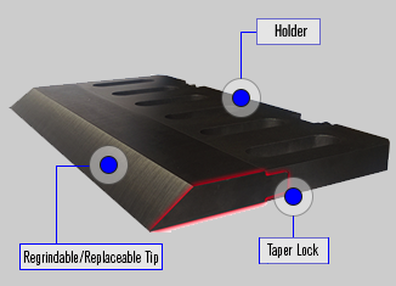 Two piece system utilizes a replaceable/regrindable tip, and holder with a multi-year part life. Taper Tip enables mills to now only pay for the steel that gets used, instead of having to replace the entire knife after only using 10-30% of the steel. CNC machined from 4140 steel. Part is designed/manufactured for longevity and has a multi-year part life. Innovative feature locks replaceable tip to holder. Manufactured from A8 modified tool steel (D2 also available). Designed to match same number of grinds as conventional solution being replaced.